Perhaps it was the full moon and the light shining in the window, but I was up almost all night, stressing over the seminar I was to do the following morning. I remember thinking to myself, "This better be good, Eric. These people need a miracle. You'd better give that to them." Our demons come out in the middle of the night, and my self-talk was telling me I hadn't done enough to prepare to save all these artists. Even though I've been in marketing my whole life, and though I've written an art marketing blog for years and consulted hundreds of advertisers with successful marketing campaigns, I wanted everything to be perfect. I kept going over my presentation in my head as I tossed and turned. Finally, just as I fell asleep, the alarm blasted me out of bed and I dragged myself down to what I thought would be an almost-empty ballroom. The room went dead silent when I asked how many people had sold 50 or 75 percent fewer paintings each year since the recession started. But most of the artists in the room sheepishly raised a hand. I remember thinking, "This is worse than I ever imagined it would be." Few people were eager to admit they weren't selling many paintings -- but then again, that's why they were attending my first live Art Marketing Boot Camp, held every morning at 6 o'clock, before the start of each day of our Plein Air Convention last April. I was expecting no more than 30 people would be willing to get up at that early hour to learn about marketing, so I was blown away when almost 500 people attended at 6 each morning. It really reinforced how important marketing was to every artist in the room. "Raise your hand if you doubled your art sales in the past 12 months," I said. One hand went up. "Raise your hand if you tripled your art sales in the past 12 months." The same hand stayed up. Then I asked, "How many people in the room are having the best year of art sales in their career?" One hand was raised. I could tell that artist was almost embarrassed because his was the only hand raised. It was the same man who had just raised his hand to say he had doubled, then tripled his sales. I knew him well because I had coached him two years before. He was having the best year for art sales in his 25-year career as a professional artist. I know what you're thinking. No, it wasn't a household name like Richard Schmid. The man who raised his hand was someone almost no one in the room knew of. He is a very accomplished artist -- but he claimed to be outselling almost everyone in the room. How could this be? I went on to tell this man's story onstage. (He has asked I not use his name in this e-mail, but those of you who attended heard me mention his name.) The recession had hit hard, and he came to me as a friend and said, "Eric, I'm not sure what I'm going to do. My sales have dropped and I haven't sold a painting in months. My wife is retiring, and we won't have her income as a backup. What can I do?" "I know a lot of people going through this. I've told them what they need to do, and every one of them has given me reasons why they were unwilling to do it. I'll tell you, but you have to be willing to change everything about the way you're doing business." Sadly, after I told him, his immediate response was, "I can't do that. It's just not the way we do things as artists." What I had recommended was not illegal, or immoral, it was just bucking the current system. I told him that the old way of doing things would never return, and that if he changed his behavior, he would sell more artwork than he ever had in his career. I could tell he didn't like it and wasn't going to do it. It made me sad. A few weeks later I saw my buddy, and he said, "I followed your advice. I started thinking about it and decided that I had nothing to lose. I'm already seeing more business." What a wonderful surprise -- he was willing to reinvent himself and take a chance on doing things differently. A few months later he was smiling and had a spring in his step, and he told me he was having the best year of his career. That's right, the best in his entire 25-year career as a painter. I was thrilled, and when I saw him that morning at the convention, he had just completed two of his best years ever. I told his story onstage, and I offered some of the solutions I had shared with my friend. Groans came from the audience. "We can't do that" said one man. I reiterated that things have changed, and that unless you change, you cannot expect to sell as much art. What about you? Are you willing to change? Think for a moment about your own life. Think how much has changed in the way you communicate, the way you shop, the way you do business. Everything has changed. Why not change the way you sell art? No longer can you put it out there and take a chance that it will sell. You can't just hope people will wander into the gallery and buy it. You have to become a marketing machine. That's exactly what I explained in detail at the Plein Air Convention. I gave chapter and verse on the solutions and strategy of my best marketing advice. Would They Return On Days Two And Three? At the end of the morning, I could tell the audience was enthusiastic and willing to embrace change, but the real test would be if they showed up on the second and third mornings. As it turned out, the room was packed on both mornings, and, in fact, the audience grew as word got out. I was relieved that the artists were getting something out of what I head to tell them. I challenged the audience: I told them that of the 500 people in the room, only 10 percent would return home and build the plan I suggested. Only 1 percent of the people in the room would stick with it and take action. I challenged them not to be one of those who did not take action. Of course, I have no way of knowing who did and who did not, other than one woman who contacted me about three weeks ago and told me she has implemented many of the things I suggested and has already seen a dramatic increase in sales. I was smiling from ear to ear. Do you want to sell more art? Do you believe you're open to trying new things? Are you willing to become a true marketer and follow a plan that will increase your art sales? I honestly believe that you can and will double your art sales in one year or less if you follow my plan. Is it easy? Nope. Is it fun? Nope. Is it necessary? Yep. Especially if you want to thrive as an artist and sell more artwork than you ever thought possible. Expecting the good old days to return is a sure-fire way to stop selling artwork. Is it worse to try something new, or to go back to a life at a job you hate? For years I've been blogging about art marketing to help my friends, but I don't make my living by teaching art marketing. I'm an entrepreneur who builds businesses with my marketing skills. I've built and sold businesses, and I've generated a great living for my family from these skills. What I'm going to teach you isn't some slick system. I'm not an art marketing guru, I'm just a guy who had to learn marketing in order to build my business. Though people have begged me to write a book, I just don't have the time. But I did agree to do the Art Marketing Boot Camp at the convention. It took me about three weeks of preparation for three mornings of teaching. It took a lot out of me, but it makes it all worthwhile when I hear that it's working. And I believe it can work for you. In fact, I tried to cram so much information into three mornings that I couldn't present it all. On morning three, I ran out of time onstage and still had a lot of important things I wanted to cover, so I told the audience I would go into the studio and record more video, adding the material I hadn't covered live. We're now shipping the Art Marketing Boot Camp DVD -- again, most was recorded live at the Plein Air Convention, and the rest was added later in the TV studio. I feel like the DVD is the complete course you need to double your sales in one year. Can you do it? It depends entirely on how deeply you're willing to invest in your career as an artist. - Will you put in the time to watch these sessions? - Will you complete the exercises in the DVD to help you bring clarity to your career? - Will you follow all the little tips and techniques I suggest that will separate you from the pack? - Will you devote time to the marketing part of your career? I cannot and will not promise that you'll double your sales in one year. Yet the average person who follows just some of my advice will see their art sales grow. You'll pay for the DVD many times over just by following a few of the basics. But if you're motivated and disciplined, you'll set the world on fire and could become one of the most well-known and best-selling artists in America. Marketing is the backbone of survival as an artist. Are you up to the task? No one knows what will happen in this economy, but if you follow my recession strategies, you will sell more artwork while others simply lick their wounds and complain about how bad things are. These techniques worked during the Great Depression, and they work today. I'm a bit of a risk taker, kind of a cowboy. I shoot from the hip most of the time. Yet when actually discipline myself to sit and create a plan, and follow my plan, as simple as it may be, I see huge success. I did that last year, and this year I'm reaping the rewards of a business that is soaring in the midst of an economic downturn. All because I practice what I teach. If I were you, I'd grab this DVD as fast as possible, watch it a couple of times, create a plan to start this fall, and follow my suggested techniques, so that 2013 is the best year in your history as an artist. It is absolutely possible. Yes, you may have to skip going out to a nice meal with the family for one night to pay for the DVD, but it will change the way you think and can turn you into a marketing machine. Even a few small ideas implemented will improve your art career. I just got this on Facebook from artist David Terry, an American living in New Zealand: "I got Eric's video Tuesday. I have seen it four times! It is one of the finest teaching materials I've ever encountered. Good work!" It was a pretty cool feeling to open the mail and see my first marketing DVD with my face on it. I'm really proud of the quality and the amount of information in this DVD program. There is one little tip I mention on the DVD to harvest new art buyers -- I didn't have time to go into it at the live seminar, but just doing that one thing will make your sales go up. If you order the DVD and call me and tell me you followed my advice and did not see enough of an increase in your art sales, I'll refund the price of the DVD. I want this to work for you. But first you have to order it. We're shipping now. To order, visit www.streamlineartvideo.com, or phone 561-655-8778 weekdays during normal business hours. I'd be truly honored if you would phone me and tell me if this DVD full of ideas made a difference in your career. I'm convinced it will. PS: My dad always used to say to me that a great education is a bargain at any price. I once attended an event that transformed my entire career. I'd reluctantly paid thousands of dollars to attend, and it has paid for itself over and over and over, for decades. I make a point of continually learning new things and educating myself. If I'm not growing, I'm going backwards. I've had numerous people tell me those three mornings of Art Marketing Boot Camp transformed their lives as artists. Nothing could make me happier. What about you? Will you allow me to help you sell more artwork and double your sales each year for the coming years? I want you to sell more artwork; I don't want you to have to take a job you hate because you're not selling enough art. I hope you'll make a decision to master marketing your own art. 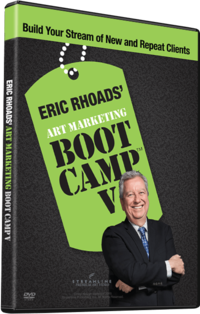 I'd be honored if you'll consider my Art Marketing Boot Camp DVD. If you can't do it now, it would make a great Christmas gift.